Today, selecting the right IOL to meet individual patient expectations is more crucial than ever. The IOL Master 500 incorporates advancements designed with the challenges of today?s cataract practice in mind: precision, simplicity, outcomes. The IOLMaster 500 is the benchmark for precision biometry. The IOLMaster 500 stands on a long heritage of highly precise measurement data. Proven in the field for more than a decade, the IOL Master Partial Coherence Interferometry (PCI) technology is the acknowledged reference point in biometry today. In the early days of optical biometry a remarkable number of cataracts could me measured. Composite signal evaluation as incorporated in the IOL Master 500 has significantly further increased both the fraction of cataracts measurable with optical technology and signal-to-noise values, a measure of the outstanding reliability of IOL Master data. With the IOL Master 500, this level of clinical confidence is easier to achieve than ever: in the all new dual measurement mode, multiple axial length and keratometry readings are captured largely automatically. The IOLMaster 500 provides minimum chair time by convenient setup, easy alignment and quick calculations. The new dual measuring mode reduces acquisition time: axial length and keratometry are now captured at once; changeover between modes happens without user interaction. An easy-to-understand traffic light indicator signals the best alignment. Right-eye and left-eye values for axial length and corneal radii are compared and checked for plausibility?adding confidence especially for challenging eyes. Clinical experience has proven user independence and high reproducibility4 of the IOL Master 500 where even the state of accommodation, pupil diameter and high ametropia do not compromise the axial length data. The IOLMaster 500 measures along the visual axis, yielding the relevant axial length even with staphyloma. Pseudophakic, silicone-filled, or eyes with a phakic implant: it?s as simple as selecting the right measurement mode, even after data acquisition. Axial length measurements with the IOL Master 500 are fast and distance independent?a great help with poorly fixating or restless patients. Even the penetration of dense cataracts has improved significantly since the early days of optical biometry. Further refining lens constants is a key ingredient of refractive predictability. The IOL Master 500 allows further refining of IOL constants based on individual post-operative data. The number of cataract patients with prior LASIK, LASEK or PRK is growing rapidly. Even if no clinical history data is available, the on-board Haigis-L formula greatly simplifies IOL power calculation in these cases. Calculation of phakic intraocular lenses is another growing need. A database of anterior and posterior phakic IOL types makes the selection of the appropriate dioptric power straightforward. The highly intuitive IOL Master 500 interaction design has set standards for easy-to-learn, easy-to-delegate biometry. It requires few clicks only and guides the user along a well thought-out workflow sequence. Previously, a patient not measurable optically meant a break in the workflow. With the Sonolink connection, IOL Master 500 patient data is easily transferred to the Accutome A-Scan synergy with a few simple clicks. After ultrasound measurement, the A-scan data is imported back to the IOLMaster 500 for IOL calculation just as quickly and easily, reducing the risk of data entry errors. 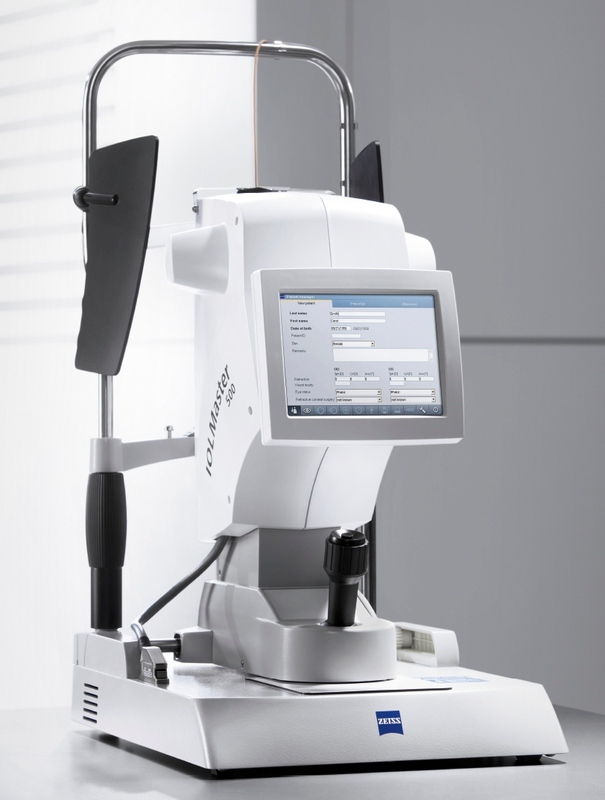 The IOL Master 500 is part of the overall ZEISS data management solution FORUM. All relevant diagnostic data is provided when it is needed, where it is needed?even into the OR for on-the-fly changes of the selected IOL. For connectivity with electronic medical records (EMR) and practice management systems, the IOL Master 500 provides an interface based on the DICOM standard. Click the button below to add the Zeiss IOL Master 500 to your wish list.